Egypt's president, Mohamed Morsi, was deposed one year after being democratically elected by the Egyptian people. For those opposed to Morsi and the Muslim Brotherhood (MB), the move by the military is seen as supporting a popular uprising and a belated effort to revive or restore the Egyptian revolution that ousted Hosni Mubarak more than two years ago. But for Morsi's supporters or those who simply had any respect for democratic governance and the rule of law, the action by the army is nothing short of a brazen though soft military coup d'etat. The military in Egypt has always enjoyed a privileged and autonomous status and is tacitly considered the power behind the throne. For decades, political power was concentrated in the hands of an elite yet mostly corrupt political and business class that monopolized power and looted the country's resources. But the revolution that toppled Mubarak was in essence a rejection not just against the dictator, but also his entire corrupt regime. One of the major demands of the revolution was to get rid of dictatorship and repression and uphold the principles of democracy and the rule of law. 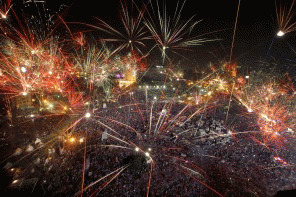 Over the next two years, the political process that followed Mubarak's overthrow allowed for the will of the Egyptian people to be expressed numerous times through free and fair elections and referenda. The people in Egypt went to the polls at least six times: to vote for a referendum to chart the political way forward (March 2011), to vote for the lower and upper house of parliament (November 2011-January 2012), to elect a civilian president over two rounds (May-June 2012), and to ratify the new constitution (December 2012). Each time the electorate voted for the choice of the Islamist parties to the frustration of the secular and liberal opposition. To the discontent of the Islamists, all their gains at the polls were reversed by either the Mubarak-appointed Supreme Constitutional Court (SCC) or the military. The lower house of parliament, of which the Islamists won 73 percent of the seats, was dissolved by the SCC a year ago, and the military has just suspended the new constitution, while ousting the democratically-elected president. In addition, Morsi and the MB did not adhere to their promise of full partnership in governance. Many of the youth and opposition groups felt that the president and MB leadership were not genuine in their outreach and only sought their participation for cosmetic reasons. Even their Islamic partners such as the Salafist Al-Noor Party complained that the MB wanted to monopolize the major power centers in the state. It did not matter that the MB did not control the military, the intelligence, the security apparatus, the police, the diplomatic corps, the banking system, or even the bureaucracy. But because of the MB's lack of transparency and openness, the perception was that they were trying to control the major centers of powers in the state and exclude other parties based on ideology while the reality was that such control was non-existent or superficial. But to the average people on the street what mattered was their security and livelihood. During his one year in power, Morsi faced enormous challenges: deterioration in security and basic services, lack of social justice, and economic decline. It appeared to many as deliberate attempts by the deep state (entrenched elements and bureaucrats loyal to the former regime) to ensure the failure of his presidency. His lack of transparency and openness to his people in favor of presenting an optimistic or upbeat outlook added to public cynicism and the perception of incompetence. Another major mistake by the MB was its failure to separate its socio-religious movement from its political manifestation, the Freedom and Justice Party (FJP). While the public in past times respected the MB for its social services and religious outreach, engaging in politics by its nature is a source of division and rancor. For example when the MB fielded its presidential candidate in March 2012, it was MB's Guidance Bureau that made the declaration instead of the FJP. In the eyes of the public there was little distinction between the MB and the FJP. So the MB was, correctly or not, held responsible for any political missteps by the FJP. In part because the 2011 revolutionary partners were sharply divided on ideological grounds, former regime loyalists, politicians, and corrupt businessmen were able to regroup and play an increasing role in the political battles that engulfed the country. Mubarak's National Democratic Party (NDP), which dominated political life for decades, was the only party in the country capable of organizing nationwide and competing with the MB. But since the public rejected the NDP (and it was banned shortly after Mubarak was deposed), it did not participate in the parliamentary elections in the fall of 2011. However, by June 2012, Ahmad Shafiq, Mubarak's last Prime Minster, represented the NDP's interests. As one of the two remaining candidates in the second round of the presidential elections, he ultimately lost by less than two percent. Morsi took over power by June 30, 2012. When he was not as inclusive as promised in his senior appointments, the opposition almost immediately turned against him. Two months after he was sworn in, they called for a massive protest on August 24, calling it "The protest to oust the rule of the Brotherhood." Their hostility and acrimony increased as the writing of the new constitution was finalized. Meanwhile, the new political openness and freedom in the country allowed for the private media, owned and controlled by many of the former regime's loyalists and supporters, to target Morsi and the MB in an orchestrated campaign to alienate and inflame the public. During the process, the secular opposition and the fulool embraced Tamarrud's message, while the latter used the offices of the NSF and held several press conferences at the headquarters of well-known media outlets of Mubarak loyalists. There is also anecdotal evidence that the group received financial support from fulool groups. Meanwhile, the private media started a well-orchestrated campaign and continuous onslaught on the MB in particular and the Islamists in general. The level of hostility and hatred spewed against them was reminiscent of the 1930s Nazi propaganda against the Jews. Dozens of incidents were reported in the past two months, in which supporters of the MB were attacked verbally and physically by strangers because of their purported associations.